FARMINGTON - The American Red Cross is reissuing its emergency call for blood and platelet donations immediately following multiple snow storms, frigid temperatures, and 35-day long government shutdown that drastically reduced crucial available lifesaving resources. 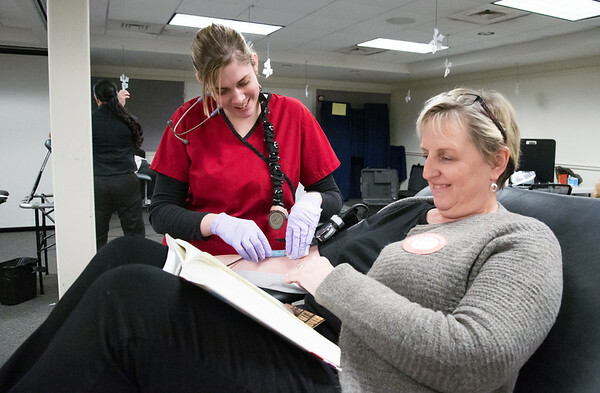 Over 5,300 blood and platelet donations went uncollected in January 2019 as the federal government shutdown led to the cancelation of about 30 federally hosted drives nationwide and many more blood drives were forced to cancel due to severe weather conditions throughout parts of the U.S. With more storm alerts and weather travel advisories likely to be put into effect within the coming weeks, the Red Cross fears additional drive cancelations and more donors putting off planned donations. He now urges others to come out and donate, as well, to prevent delays in essential medical care. All eligible donors, especially platelet and type O blood donors, are urgently needed to help restock blood bank shelves for patients in need. Schedule your donation appointment by using the ARC’s free Blood Drive App (text “BLOODAPP” to 90999 for quick and easy download), logging onto RedCrossBlood.org, or calling 1-800-RED CROSS (1-800-733-2767). Blood and platelet donors can save time at their next donation by using RapidPass to complete their pre-donation reading and health history questionnaire online before arriving at the blood drive. To get started, follow the instructions at RedCrossBlood.org/RapidPass or use the Blood Donor App on the day of your donation. Although the Red Cross regularly strives to maintain a five-day supply of blood to meet patient needs, due to the fall in donations, there is less than a three-day supply of most blood types on hand. The Red Cross attempts to be prepared for any emergencies requiring significant volumes of donated blood products, but donations are currently being distributed to hospitals faster than they are coming in. Feb. 23, 8 a.m. - 1 p.m., Bristol Eastern High School, 632 King St.
Feb. 6, 12:30 p.m. - 5:30 p.m., John Weichsel Municipal Center, 196 North Main St.
Feb. 10, 10 a.m. - 3 p.m., Connecticut Sikh Association, Inc., 1610 West St.
Feb. 27, 8:30 a.m. - 1:30 p.m., American Legion Hall, 66 Main St.
Posted in The Bristol Press, Bristol, General News, Plainville, Plymouth, Southington Herald on Wednesday, 30 January 2019 18:55. Updated: Wednesday, 30 January 2019 18:58.